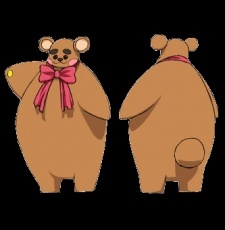 Kuma (Teddy in english) is a person in a bear costume who usually follows Lin Grace around. Kuma is actually a small shy pink haired girl who wears a bear suit. She has only been seen outside of this suit by Densuke. In the bear suit she gains super strengh much to the annoyance of Densuke who is usually on its receiving end. One day after inadvertantly upsetting her, Densuke ran into Kuma outside of the suit when she was injured, unaware that she was the girl in the suit. After helping to heal her wound, she learned Densuke actually liked her. Her older sister also wears a similar bear suit. In the manga Kuma appears in a small pencil comic at the end of books called 'together with kuma'.